Booking is essential - please use booking form below. Please remember to include your email and phone number. Scroll down to see a booking calendar. The calendar is indicitive only. Use the small arrow (top right) to see future months. It is uneconomic for me to open the Lodge for less than $250. If you are a single, couple or family please look for a weekend when you can share with others, or book the bach. The Lodge buildings accommodate up to 38 people in 17 double, twin and single bedrooms that have changed little since they were built in 1910. It is original, a little rustic and refreshingly simple. The Lodge is self-catering. Cooking and bathroom facilities are communal. (Additionally there is the Whatipū Bach which sleeps up to 8, across 3 double bedrooms). Cooking utensils, crockery and cutlery are available for guests to prepare their own meals. Fridge space is limited so we suggest that large groups coming in summer bring additional chilly bins and ice. Guests should bring their own sheets and duvets/blankets, or sleeping bags. Pillows and pillowcases are provided. Bathmats and hand towels are supplied as are tea towels and dishwashing/cleaning supplies. Hot water bottles are a must for chilly winter nights. Guests should also bring torches, insect repellent and sunblock in summer, footwear for hot black sand and suitable clothing for changeable conditions. In winter gumboots are recommeneded. There are five toilets and three showers in a modern complex that has continuous hot water. There is a sixth toilet located within the porch of the Gibbons Homestead. The Lodge has spacious grounds, a full-sized billiard table and a tennis court. There is also a tuned piano and a wonderful range of board games and books. 80 watt speakers are available for amplified sound. Electricity | Whatipū does not have mains power. A micro-hydro system generates a small amount of power continuously, which is supplemented by solar panels. We also have a back-up diesel generator, which can cope with larger loads. There are some limitations but almost all of these can be managed*. Guests planning special events such as parties and celebrations need to discuss their power requirements with management beforehand. Our sine-wave DC to AC 240 volt inverter allows you to safely charge devices. *Slow cookers cannot be used. Heating | there is a very effective wood burner in the main dining room. The bedrooms are unheated and in winter guests need to bring adequate bedding and hot water bottles. Please check the forecasts and plan for your comfort. Water | Fresh stream water is piped from further up in the hills. The water is filtered and ultraviolet light treated but does not always meet standard drinking water requirements and can become discoloured after heavy rain. Ministry of Health recommends boiling the water for drinking. Containers of city supply water are made available when the water becomes discoloured. Barbecue | There are 2 hooded four burner gas barbecues available. We supply the gas. 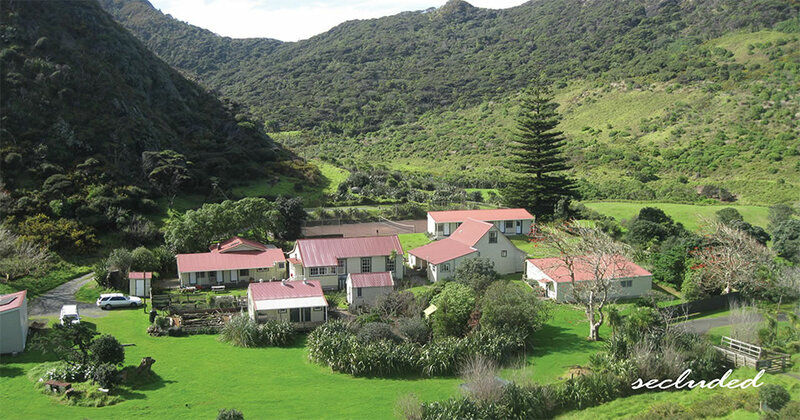 Fire | Whatipū Lodge is in the Rural Fire District and on leased land from Auckland Council. Fires and fireworks are not permitted. Fire suppression costs can be billed to the person who starts a fire in a Rural Fire District. Rubbish Disposal | Please take recycling home with you as we do not have a recycling service at Whatipū. As part of our sustainability plan we ask that you help us keep rubbish to a minimum. Talk to us about how to sort your disposable rubbish to ensure we are able to manage its removal. Our chickens appreciate your food scraps. Save meat scraps for the eels. Communications | Please switch your phone to flight mode on landing at Whatipū Lodge. There is limited coverage. There is a strong signal at Whatipu Beach. First Aid | The Lodge management is trained with current first aid certificates. In the sitting-room off the main kitchen is a comprehensive first aid kit and manual. We also have a self-explanatory defibrillator in the event of a heart attack. Please report any use of first aid materials so they may be replaced. Dogs | Whatipū is a wildlife reserve and dogs are banned from the beach and wetland. For this reason there is a ‘No Dogs’ policy at the Lodge, Bach and Campground. The ’No Dogs‘ policy is strictly enforced. Arrival and Departure | Guests are generally welcome to arrive about 2pm and depart mid afternoon. There may be occasions when arrival and departure times may have to alter to fit around other bookings. We do our utmost to keep you informed. Minimum group size | There is a minimum charge of $250 per night to open the Lodge. It is uneconomic to open for a single person, couple or one small family. Please gather a couple more friends and make a group booking. See pricing linked here. Limited availability | You will be sharing the Lodge facilites with others who have booked. All guests have access to the full lodge facilities, though there might be some daytime restrictions due to meetings/group work etc. Sometimes you will be required to use the 2nd kitchen, by the tennis court row of rooms. When the Gibbons Homestead is booked only guests using those rooms have access. Limited availability means you will be joining others who have also booked to stay. There is a 2nd kitchen suitable for up to 10 people, which offers an alternative space. If you would like us to contact you about a booking or an enquiry, please complete the form below and we will get back to you.